Generally religious horror movies do nothing for me. The only movie that falls into that category I do enjoy, and have been summarily horrified by, is The Exorcist (1973). 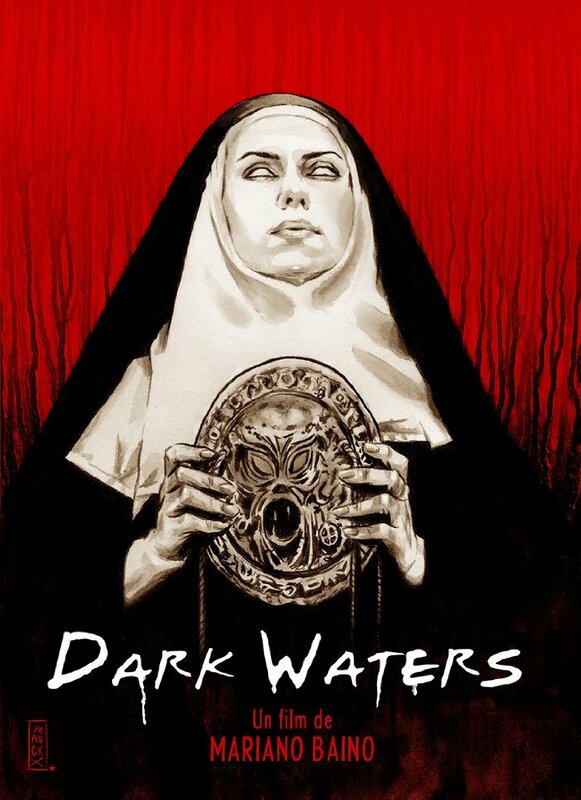 Nunsploitation flicks also fall into this category, so it was a bit of a conundrum when the opportunity to review this new blu-ray of Dark Waters presented itself. I am, however, a big fan of any adaptation of anything H.P. Lovecraft ever wrote or any “Lovecraftian” movie in general. 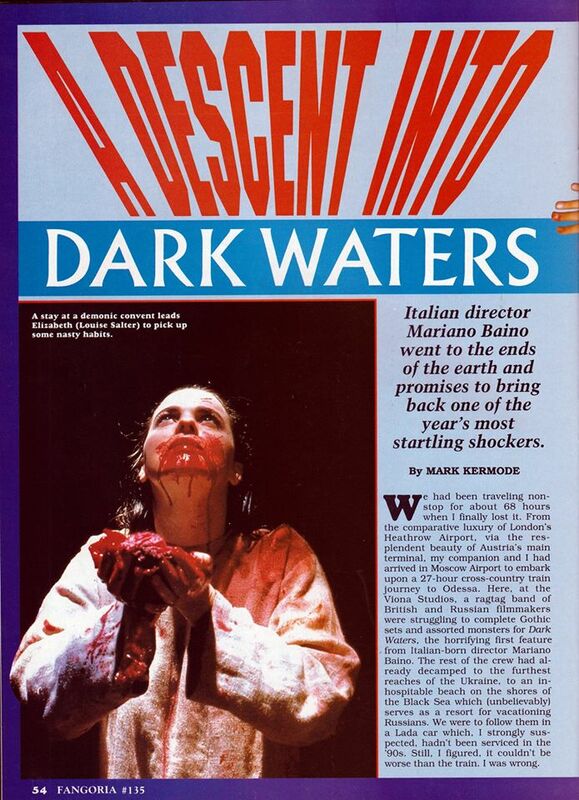 I remember reading the Fangoria article on Dark Waters, even perused it again, but there’s no mention of it being inspired by, or connected to Lovecraft’s mythos. Obviously, there’s a big Lovecraftian vibe in it, but the “nunsploitation” aspect was a big turn off, hence why I never wanted to see it Come to find out, though, recently it actually is some kind of loose adaptation of Lovecraft’s novella, The Shadow Over Innsmouth! Okay, now I want to see this! But the question still remained how much Lovecraftian horror is there in the movie and is it enough to offset the “nunsploitation”? Tonight I’m going to find out the answer to that very question and that will tell me if Dark Waters ends up making my collection. If it does, it’ll join other Lovecraft adaptations and Lovecraftian-styled flicks on a special shelf I have. 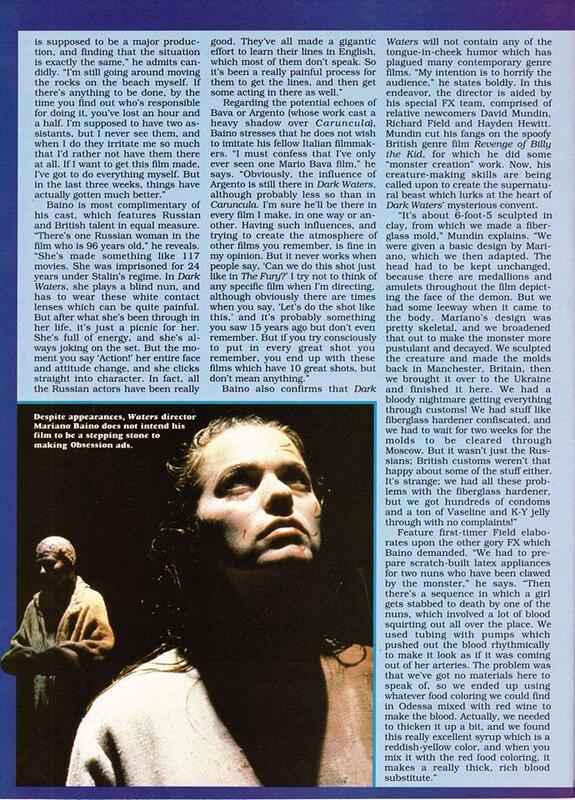 Full article from Fangoria #135. Click photos to enlarge and read. The movie takes place on an island that houses a convent, and our lead character of Elizabeth (Louise Salter) grew up on that island for about seven years before her father finally whisked her away. She has no memory of those seven years and her father has recently died leaving her with the financial duty of continuing sending payments to the nuns. She also has a friend who’s recently taken to the life of the nunnery living there. Her father also told her to stay away , but she doesn’t heed those warnings. So, her visit is a two-fold one, she wants to see her friend, Theresa (Anna Rose Philips), and find out why her father was sending them money for the past two decades. There’s a prologue that on its own makes no narrative sense, but gets some explanation in the final act, though the reason why the ocean broke into that Priest’s church and killed him I still don’t know why. Perhaps, it was just a by-product of general Lovecraftian aquatic evil, in which case it makes total sense. More easily explained later on are the scenes of a nun fleeing with a very large amulet that gets broken into pieces after she’s mysterious shoved off a cliff and dies on the rocks below. This amulet has a hideous creature’s face on it (see cover of the blu-ray below) and it’s this broken amulet that’s crucial to the story, for the corrupted nuns have been seeking to put it back together for the past twenty-years, once back together it’s supposed to summon a creature, a beast, these fallen sisters have been praying to, taking care of, and have been a product of for a long, long time. Theresa is murdered by the nuns before Elizabeth ever shows up. She was getting too nosy, eavesdropping on a ceremony deep under the convent in the catacombs. She also found a piece of the amulet and loses it as she’s stabbed to death. Once Liz is on the island she’s pretty much trapped and the movie plays out roughly over a two-night event. While there she meets Sarah (Venera Simmons), an assistant Mother Superior (Maria Kapnist) blesses Elizabeth with to make her stay more welcome, and has weird dreams of two, little girls, one of them having half eaten a rabbit. These dreams persist, and as Elizabeth comes to the conclusion the nuns killed her friend, she fears for her life, and tries to escape. Rightly so, as the nuns make several attempts on her life, but she manages to stay alive long enough to learn about her childhood and what it might mean for her future. What this whole stay on this island is leading to is a reunion with Elizabeth’s mother who she was led to believe died giving birth to her. Not so, she never had a mother, well, a human mother anyway. And those dreams of those two little girls are really of her and her sister—Sarah! Her mother is that beast the nuns live by the code of, and she meets her down there in the catacombs, with Sarah, and Sarah is now seen without her clothing (waist up), revealing herself to be more mutant than human. Liz got all the human genes apparently. In keeping with the vielof Lovecraft Liz and Sarah’s “mother” is shown through a hole in the wall, in shadow, and in a long shot where you can just barely see her/its entire form. 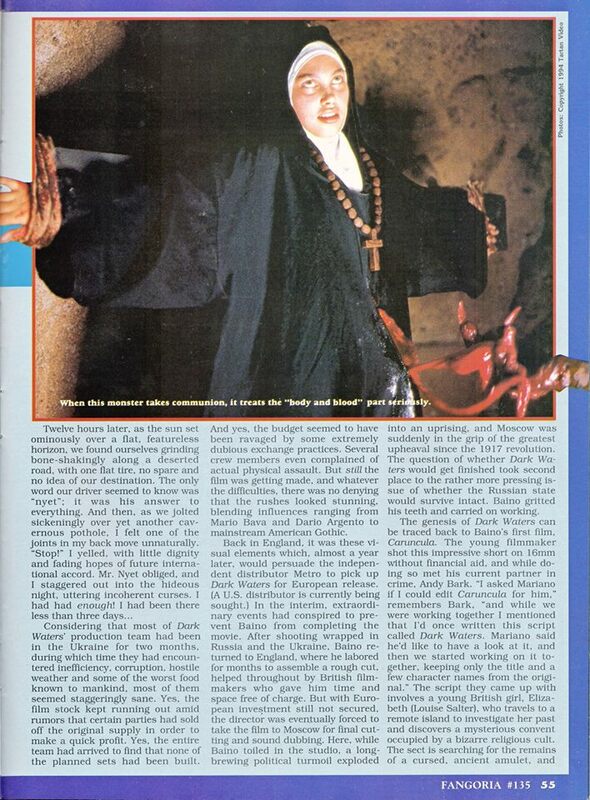 In fact the only places where you see her “mother” fully is in a drawing in an old book Liz is seen thumbing through early in the movie, and in the Fangoria article above. I admit to wanting a real good look at her, which you do get of her head, just not of her whole body, but in the end its half-seen presence was engineered like a Lovecraft tale, and for that I can’t complain. Speaking of which Liz’s fate is a downbeat one, as I expected it to be. You see, she herself has set eyes on this creature, so she too has gone blind and has decided to become a nun like the others, wearing a chunk of that broken amulet as a necklace, and those that are blind aren’t necessarily devoid of sight. The nuns keep a crazy, blind guy in a pit whose sole job is to paint clairvoyant pictures in human blood. And so the cycle of corruption and mutation continues . . . 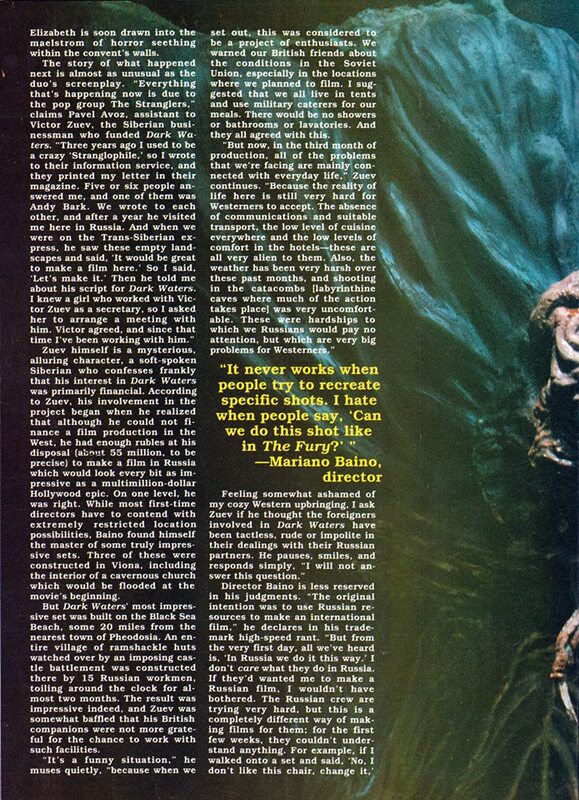 The movie is a visual treat, taking place in real locations, namely where they filmed the catacomb scenes, and the effects for the creature are very well done too. 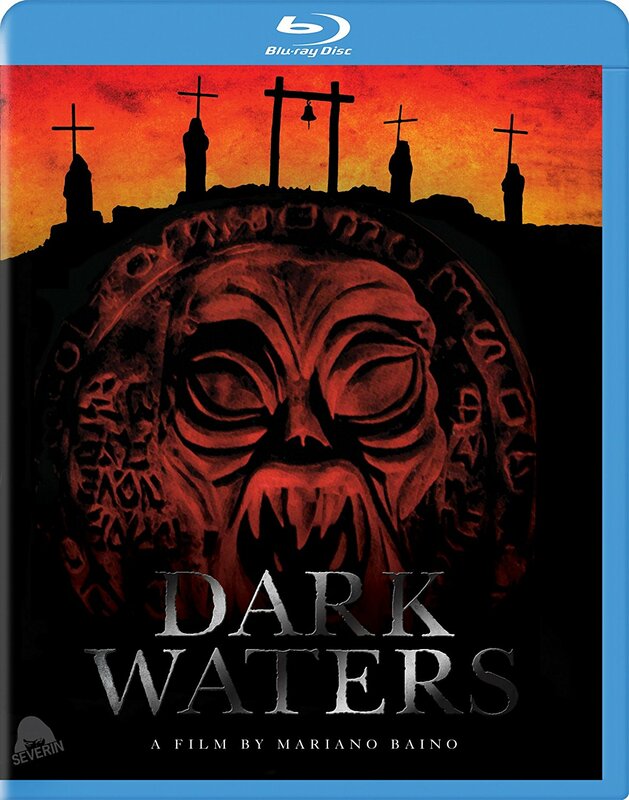 Dark Waters has made it to disc before here in the States back in 2006 courtesy of No Shame Films (now out of business), but Severin Film’s release marks the first time it’s been converted to blu-ray. There’s also a new DVD available too, both of which street on April 25th! You can order them here on Amazon, or on Severin’s website! NOTE: As far as I can tell all the No Shame extras have all been ported over. The ones labeled NEW are Severin created exclusives. This is one of those movies where making it was an adventure all it’s own, so I recommend taking in the extras, especially the doc, ‘Deep Into The Dark Waters.’ You’ll also get a few more shots of the monster. 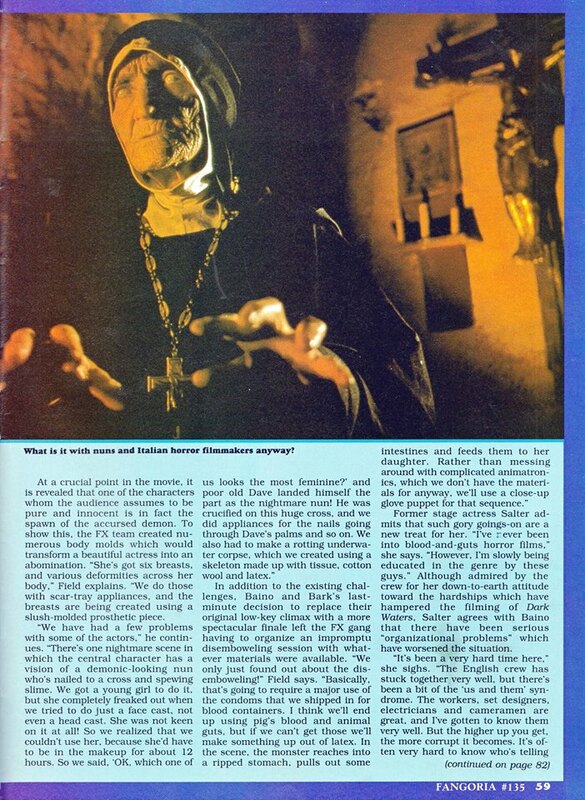 If you’re ever looking for a double feature to put on one night along with this movie, check out Empire Pictures Catacombs (1988), another religious based horror flick that is also very visually stunning in a similar manner. Gallery | This entry was posted in Dark Waters (1993) U.S. Blu-ray. Bookmark the permalink.